The walls of its prison grow, like an atrocious dream. The beautiful mask has changed, but as always it is unique. What purpose will my talismans serve: the exercise of letters, the vague erudition, the learning of words used by the rough North to sing of seas and swords, the serene friendship, the galleries of the Library, the common things, the habits, the young love of my mother, the military shadow of my dead, the intemporal night, the taste of sleep? Being with you or without you is the measure of my time. Now the pitcher breaks above the stream, now man rises to the voice of the bird, those who view through the windows have darkened, but shade has not brought peace. 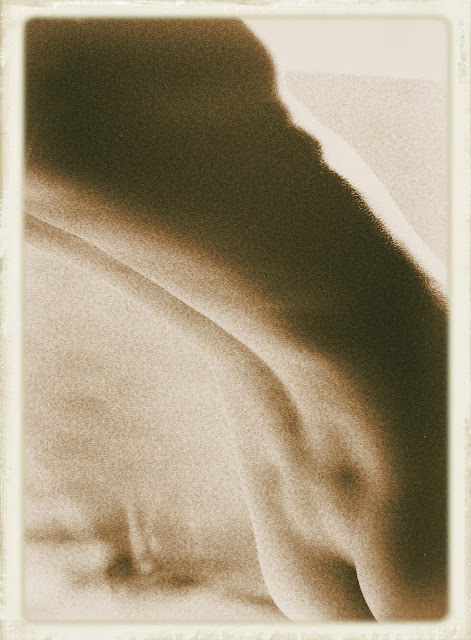 It is, I know, love: the anxiety and relief of hearing your voice, the wait and memory, the horror of living in succession. It is love with its mythologies, its little useless magic. There is a corner I do not dare pass. Now the armies surround me, the hordes. The name of a woman betrays me. A woman hurts throughout my body. My friend architect Abraham Rogatnick, who died five years ago informed me of his forthcoming death a year before. He told me, “I know this is a cliché, but after my death it’s the deluge.” What I believe he meant is that whatever would happen after his death would not be of any bearing to him. Oblivion may have had something to do with it. At my age of 73 I am beginning to get the message. About a month ago I found out (it was not reported loudly anywhere) that the Vancouver Courier would no longer publish twice a week. It was also revealed that it would be business as usual on the net and that they would “publish” every day. Since I am a product of the last century, for me real publishing is something that ends up with ink on paper and on my fingertips. I publish a blog every day but I squirm when I think that this is true publishing. Furthermore I found out that the Vancouver Courier would now be available in special boxes like those of the Georgia Straight, the Westender, and Xtra Vancouver. For those like me who might live on the West Side you would not note a ubiquity of Xtra Vancouver boxes nor would you know that at some point this gay/bisexual/transgender/etc publication was formerly called Xtra! West. Note the loss of the exclamation mark. Furthermore (again) if you note the changing demographic of my West Side neighbourhood, recently amalgamated as Vancouver Granville for the next federal elections, you would suspect that it didn’t pay off for the Vancouver Courier to deliver their West Side Edition here. Every few months we stop getting it but I then email the circulation manager and it's delivered again. I guess we represent a house that is simile for circling wagons. For those who know and read the Vancouver Courier (I do but my wife opts for the "editorials" for IGA, London Drugs, Best Buy, etc) they might go directly to Kudos & Kvetches. This would be the only column where you might read nasty intramural (but newsy) comments about the disaster that Michael Kissinger (we who know, know he is Mr. Kvetch) thinks the Vancouver Province, The Vancouver Sun and the Georgia Strait are. That is fun as well as the irreverent choice of language. Compared to the Vancouver Courier's real gossip columnist and that of the Vancouver Sun's specialist of the bent soprano sax Kudos & Kvetches is real gossip. Those who know and have a good memory might miss Geof Olson’s musings on the existence of flying saucers. I do as I remember. So it was with extreme surprise that last week and in this week’s Vancouver Courier (dated September 3) that I saw on the strange two “editorial pages”, page A 10 and A11(complete with a big ad – New Dentures or a Natural Smile? & Famoso - Neapolitan Pizzeria) a tiny rectangular masthead. If you ask those who are under 30 they would probably not know what a masthead is. They might guess it is a shark. The masthead had the picture of three people, Publisher Dee Dhaliwal, City Editor Michael Kissinger and Tara Lalanne as Director Sales & Marketing. Nowhere could I find the name of the editor or find a street address. 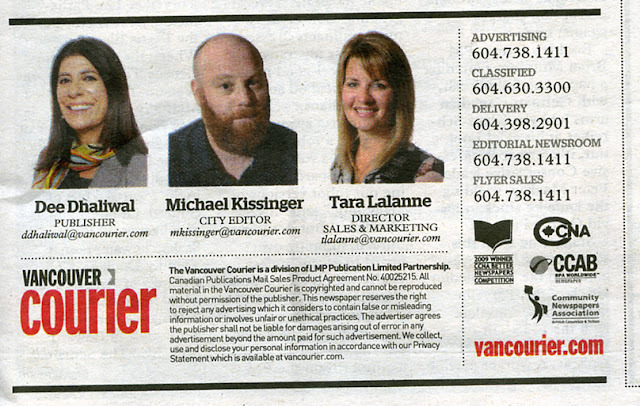 On the Vancouver Courier’s web page there was no masthead but something like it can be seen under “Contact Us”. I noted that there Michael Kissinger was listed as editor. I pressed the email link and got a blink@ address. Barry Link was the former editor. Not more than 30 minutes later it was all corrected and now Barry Link like Ballet BC’s John Alleyne is now a non-person in the old Soviet style of disappearing people. Still in my memory is the Vancouver Courier scoop (not quite the same as Breaking News!!) in which they revealed that a West Side Manse was being used as a house of ill repute. The Vancouver Sun was caught with their pants up. But the above is not all that bad if you compare the Vancouver Courier's crisis of a diminishing masthead with that of art magazine Geist. If you live on the West Side you would never suspect of its existence. There is no masthead but there is a street address. They (Geist, whoever they might be) mention an editorial board. It is not hyperlinked. There is blog on the net that mentions some sort of palace coup that happened in April. As an Argentine born Canadian all these behind the scenes rumblings and shifts in our venerable journalistic tradition make me homesick for the real palace coups of my country. In those palace coups that other venerable tradition that is our CBC would have been de-masteheaded a long time ago as they would not have waited for the slow and painful efforts to transform the Corporation into a geist by our present supreme leader. I must stop right here as I want to listen (and see) Rachel Maddow tell me the latest about Trump.